The Allavino FlexCount Series VSWR30-2BWRN Dual-Zone Wine Refrigerator can store up to 30 of your favorite wine bottles in a 15" wide cabinet that is perfect for replacing old trash compactors. It features an elegant black framed glass door that is tinted to keep harmful light out while showcasing your wine in style. The front venting design allows the unit to be built-in to cabinetry but the finished sides and top make this compact wine cellar attractive for freestanding environments as well. With it's dual-zone functionality, you are not limited to only storing red or white wine - now, you can do both at the same time! The VSWR30-2BWRN boasts extra-durable metal shelves with wood slats and stainless fronts that easily glide out on roller assemblies allowing you to quickly access your entire collection. Despite it's compact size, this handy wine cooler can store up to 30 bottles for convenient access in your kitchen or dining room. Each zone of this dual-zone wine refrigerator can be set low enough for sparkling wine or high enough for red wine, but the two zones must be set at least 4 and not more than 10 degrees apart. This unit is front-venting, and can be built in to your cabinetry for a seamless look. It also has finished sides and top, allowing you to use it as a freestanding unit that will look great in any room of your home. A built-in security lock protects your collection, and two keys are included so that you can always have a backup on hand. WARNING: This product can expose you to chemicals including styrene, which is known to the State of California to cause cancer. For more information, go to www.P65Warnings.ca.gov. Two independently controlled temperature zones. Towel Bar and Curved Handles included for you to choose from. All black interior emulates the traditional wine cellar. 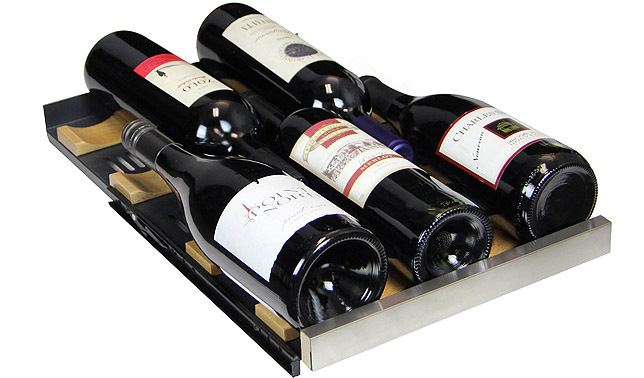 Roller-glide shelves extend effortlessly minimizing agitation to the wine. Shelves constructed of durable metal so they will not sag over time. Blue LED lighting beautifully illuminates the interior without the heat created by an incandescent bulb. Note: The lower zone must be set at least 4° and no more than 12° higher than upper zone. It is normal for there to be a 3-5° variance between the top and bottom of a zone. Minimum Ambient Temperature: The lowest temperature you want to store your wine at..The unit does not have a heater, so if the ambient temperature is lower than the set temperature, the internal temperature will match the external temperature. Please Note: The handles are not attached to the unit during shipping, and will need to be installed when the unit arrives. This wine cellar has 6 shelves that can hold up to 5 bottles each for a maximum bottle capacity of 30 bottles. The maximum capacity is based on the standard Bordeaux size bottle. This is the standard 750 mL bottle, which most wine refrigerators are configured around as it is the most popular size on the market. It measures 11-1/2" tall with a 2-15/16" diameter and the shoulder tapers up from 7-3/4" to 8-1/2". This wine refrigerator can easily store 5 of these bottles on each shelf for a total of 30 bottles. This bottle is wider and shorter than the standard 750 mL bottle. It measures 10-5/8" tall with a 3-1/4" diameter and the shoulder tapers up from 5-1/2" to 8". Bottles this wide don't usually fit in undercounter wine refrigerators and if they do, they have issues with rubbing on the shelf above and scuffing your labels. This wine refrigerator has no issues with this type of bottle so your maximum capacity will not be affected if you have them in your collection. This bottle is taller than the standard 750 mL bottle. It measures 12-1/16" tall with a 2-15/16" diameter and the shoulder tapers up from 8" to 9". The taller shoulder makes the bottles touch and pushes the outer bottles over the edge of the shelf. This is not a problem on the top shelf in each zone or the bottom shelf, but it does create an issue on the remaining three shelves. On those shelves, you can alternate 3 of these bottles in front with 2 standard 750 mL bottles in the back, allowing you to store up to 24 of these wine bottles without having to reconfigure the shelves or affecting the overall bottle capacity. This bottle has the same diameter at the base, but the shoulder is wider. It measures 11-7/8" tall with a 2-15/16" diameter at the base and the shoulder tapers up from 7-1/2" to 8-1/4" with a 3-1/16" diameter. The wider shoulder pushes the outer bottles over the edge of the shelf. This is not a problem on the top shelf in each zone or the bottom shelf, but it does create an issue on the remaining three shelves. On those shelves, you can alternate 2 of these bottles in front with 3 standard 750 mL bottles in the back, allowing you to store up to 21 of these wine bottles without having to reconfigure the shelves or affecting the overall bottle capacity. Other 15" undercounter wine refrigerators would not fit these bottles without removing shelves. Until now, you wouldn't dream of fitting a Pinot bottle in an undercounter built-in wine refrigerator without drastically reducing the overall capacity. It measures 11-5/8" tall with a whopping 3-1/2" diameter and the shoulder tapers up from 5-1/2" to 8-1/4". On this model, you can fit 8 pinot bottles without reducing the overall capacity or reconfiguring shelves. Three bottles fit on the bottom shelf, three more fit on the front of the top shelf in the lower zone and two more fit in the outer front grooves of the top shelf in the upper zone (the light does not allow a bottle with this diameter to fit in the center front groove of the top shelf, but another bottle of any type can fit there). Champagne bottles are too big to fit on the upper shelves, but you can still store 2 on the bottom shelf without having to remove a shelf. They measures 12-1/4" tall with a 3-3/4" diameter and the shoulder tapers up from 5-1/2" to 7-3/4". Most wine refrigerators this size would not be able to store any Champagne bottles without removing a shelf. Perhaps there are people out there that only drink one type of wine, all the time. Most wine connoisseurs with a diverse palate are going to have varying bottle sizes in their collection, so having the ability to store all those varying bottle sizes without having to reconfigure and reduce your storage makes this the wine refrigerator of choice. New Leaf ServicePRO 1-year warranty is $89.00. New Leaf ServicePRO 3-year warranty is $149.00. :: PLEASE NOTE :: Select desired warranty. Price is automatically included in drop down menu above. 1-Year Warranty: This Peace of Mind from New Leaf ServicePRO Service Plan provides an additional 1 year of coverage from the end of the manufacturer's warranty. 3-Year Warranty: This Peace of Mind from New Leaf ServicePRO Service Plan provides an additional 2 years of coverage, extending the manufacturer's original 1-year warranty to 3 years. This plan is fully insured by an insurance company rated A- by A.M. Best. You will never have to pay for parts and labor of any covered repair during the term of the plan. You can call the toll free number 7 days a week 24 hours a day with questions regarding your service plan or if your product needs repair. ServicePro has an entire network of pre-screened, fully insured, manufacturer authorized service centers. If ServicePro can't repair the covered product, we will replace it with a product of like features and functionality. There is no need to worry about hidden charges. ServicePro covers repairs to the product in the event of an electrical or mechanical failure. In the event that the covered product is sold or transferred at anytime during the term of the Service Plan then the coverage may be transferred to the new owner. At the end of the prescribed term, you have the option to renew the service plan. For as long as you own the product. ServicePro protects you in the event you experience food loss as the result of an electrical or manufacturer failure. $200 per qualified event. This Service Contract does not cover: unauthorized repairs or modifications; theft, abuse, misuse, neglect, vandalism, or environmental or weather conditions; any repair covered by a manufacturer's warranty; cosmetic or structural items; component(s) never covered by a manufacturer's warranty; loss of use during the period the product is at a repair facility or otherwise awaiting parts. In addition the plan does not cover damage to a non-operating part, damage to any part that is replaced periodicaly throughout the life cycle of the appliance. For a complete list of exclusions, please review the "Exclusions" section in the complete terms and conditions. This can be found at www.newleafservicepro.com, view terms and conditions. Warranty is only applicable for residential applications in the contiguous 48 states. This extended warranty cannot be used with an appliance installed in a commercial environment.